Home Healthcare Solutions Company, LLC (HHSC) has been one of the Chicagoland area’s most respected home healthcare providers since 2006. Our experienced and compassionate staff of skilled nurses and therapists provide a wealth of services. We educate our patients, giving them the tools they need and the care they deserve. Under a physician’s direction, HHSC will manage the patients plan of care. HHSC provides home healthcare services, including skilled nursing, rehabilitation services, behavioral health, and medical social services. We can also arrange the rental and purchase of medical equipment. For a full list of services, visit our Services page. 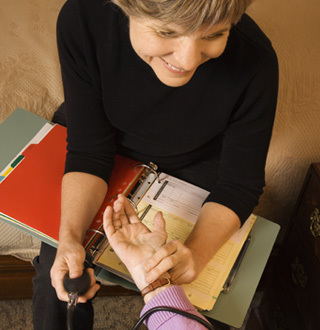 HHSC is a licensed medicare certified home health agency. Home Healthcare Solutions Company, LLC (HHSC) is committed to providing high-quality, compassionate care. Since its inception, HHSC has continued to increase their workforce. All HHSC team members are experienced, well-educated, and committed to ensuring a high-quality of life for all of their cherished patients and their families. Content copyright 2019 © Home Healthcare Solutions Company, LLC All rights reserved.